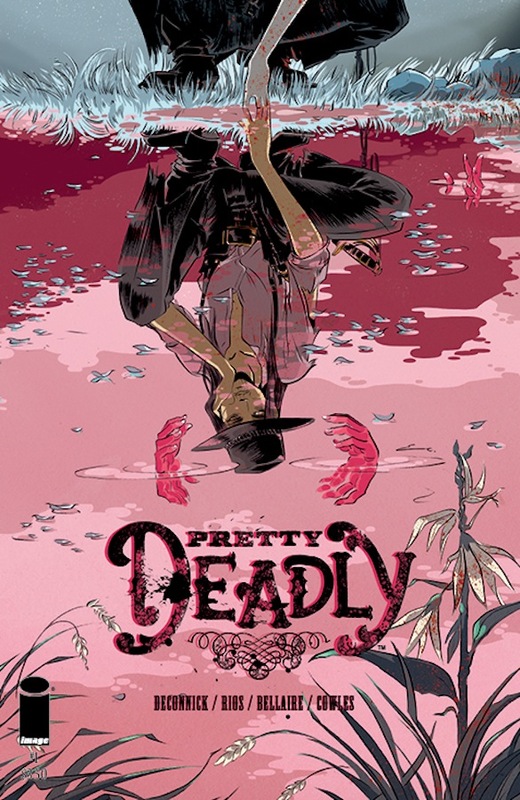 Pretty Deadly had so much promise. I was immediately interested in this book when I read the premise – Ginny, the daughter of death, rides on the wind as “a reaper of vengeance, a hunter of men who have sinned”. Couple the daughter of death in a spaghetti western setting and I was sold. Unfortunately, the final result didn’t quite live up to the hype. Kelly Sue DeConnick’s story is a western set sometime during the 19th century but it is very firmly rooted in a world of magic, the supernatural, myths, and almost feels like a fable at times. Volume 1, which collects issues #1-5, tells the story of Deathface Ginny, the daughter of death who bears the marks of her father on her face, and a young girl named Sissy as she unknowingly continues on her journey to become Death. That’s the story at its most basic and it sounds really interesting. 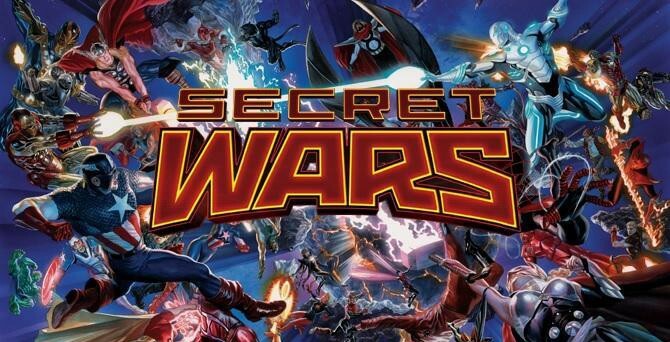 Unfortunately, DeConnick added an abundance of different elements to the story that did nothing except convolute it and by the end I was scratching my head as to what had really happened. The story would have benefitted so much had DeConnick kept it relatively straightforward. Instead, she introduced characters without ever clearly stating their intentions or motivations and she never really developed any of them through the whole opening arc. It is clear DeConnick desperately wanted the characters in this book to have emotional resonance with its readers, but because she failed to develop them it just doesn’t happen. It appears DeConnick wanted to create an air of mystery with her characters at their introduction, but even by issue 4 the air of mystery has only thickened into complete confusion. Who is Johnny Coyote? What is his story? I couldn’t figure out who he actually was. Why did he let Sissy steal the note from him? It’s never really clear why he wants Sissy to take up her role as Death or what he gains from it. Ginny had so much potential as a character but DeConnick didn’t flesh out her story enough. Why was she running from Death? What was the purpose of Big Alice? Was she another daughter of Death? It seemed she was there to bring Ginny to Death but failed as Ginny defeated her in an epic showdown, but then Alice was reincarnated with one more chance to apprehend Ginny, only to willingly let Johnny kill her. What a waste!! This is one of the areas of the story where DeConnick failed to clearly illustrate her characters intentions and motivations and the story seriously suffers from it. What was the point of Bunny and Butterfly? 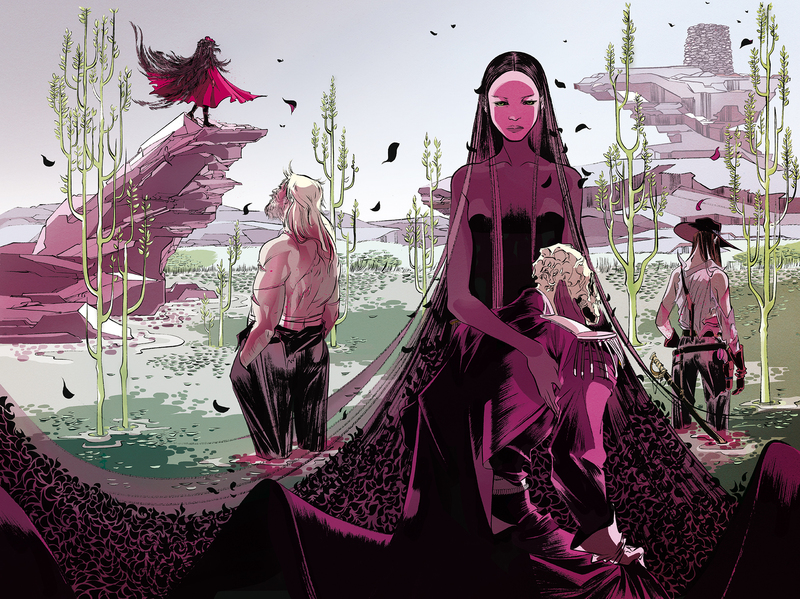 All is not doom and gloom for Pretty Deadly though. The art by Emma Rios is superb and the character designs are fantastic! The bright pastel colours used by Jordie Bellaire really makes Rios’ art pop off the page. I did find some of Rios’ panels to be a little muddled at times but I think it might have been just me. I honestly feel this book is worth a read just for the art alone. The story is a mess but Rios’ art is a treat for the eye. If you see this book in a library, or even at a decent price, it’s worth picking up. Such mixed reviews on this one. The artwork looks interesting enough that I’m going to give it a try and see what I make of it, even if the story’s a bit muddled.